Frederick Catherwood offers a tribute to Dr. Martyn Lloyd-Jones. The MLJ Trust has made the landmark decision to make available all 1600 sermons by Martyn Lloyd-Jones available as free downloads beginning today. This is probably the biggest announcement the MLJ Trust will ever make. Starting from tomorrow, April 12th, all 1,600 recorded sermons by Dr. Martyn Lloyd-Jones will be available to download, at no cost, to anyone who wants to listen to them! There are no exceptions, so the Ephesians sermons, Romans sermons, etc. will all be available (it will take a few days to make sure that they are all included in the library). All one has to do is join the MLJ Library (membership is free of course) and start to download! Simply go to our newly updated site athttp://www.mljtrust.org and click on “MLJ Library”. We applaud the MLJ Trust for their work in preserving the audio of the Doctor’s sermons in the past, and we now applaud them for making his sermons available to the world. I would encourage you to make a donation to support them in this new period for the Trust. In recognition of the landmark announcement of the opening of the MLJ Trust audio archives, we have for our Thursday Theology Video two videos of the Doctor himself. The first video is a biography of Lloyd-Jones, and the second is a biography of George Whitefield made by Lloyd-Jones. Welcome to a brand new year and a brand new programme from the MLJ Trust which we are calling, “From the MLJ Archive”. We are opening our archives to bring you each week a complete and unedited full length sermon by Dr. Martyn Lloyd-Jones. We begin today with one of Dr. Lloyd-Jones most famous sermon series which is his verse by verse study of Paul’s letter to the Ephesians. So let’s travel back to the year 1954 to join the congregation at Westminster Chapel London as Dr. Lloyd-Jones introduces us to this wonderful letter. Don’t miss this weekly dose of MLJ. You can also subscribe to the podcast so that you will not miss any of the sermons. Ian Vaillancourt has posted links to some free mp3’s of Martin Lloyd-Jones sermons. Some will only be available a short time so hurry on over to Keeping Christ Central and get them while you can. Thanks to Ian for the note. If you haven’t checked out Lloyd-Jones messages at Living Grace on OnePlace, do yourself a favor and download a few of his messages before they are gone. Living Grace only keeps 7 messages in rotation, so they leave pretty quick. A great 6 part series on Christ in the Heart only has the last 3 messages posted, and they are worth a listen. I’m a big Lloyd-Jones fan, and someone who pays the high prices for mp3 sets at the Martyn Lloyd-Jones Recordings Trust. So when you can find him for free, you don’t waste any time starting the downloads! By the way, if you have a feed reader, link to the Living Grace RSS feed so that you will be kept up to date on their weekly additions. News flash! 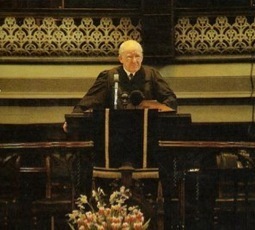 Martyn Lloyd-Jones at Oneplace. There is only one show in the queue at the moment. I will be anxious to see how frequently the MLJ Trust releases audio to this site. They have been posting a new sermon once a week on the MLJ Trust site, and this may just be a migration that will get his weekly sermons a wider audience. Thanks to Mark Berggren for bringing this to my attention.